I see diagrams like this lot, in the context of Lean Sigma. Click on it for a larger view. 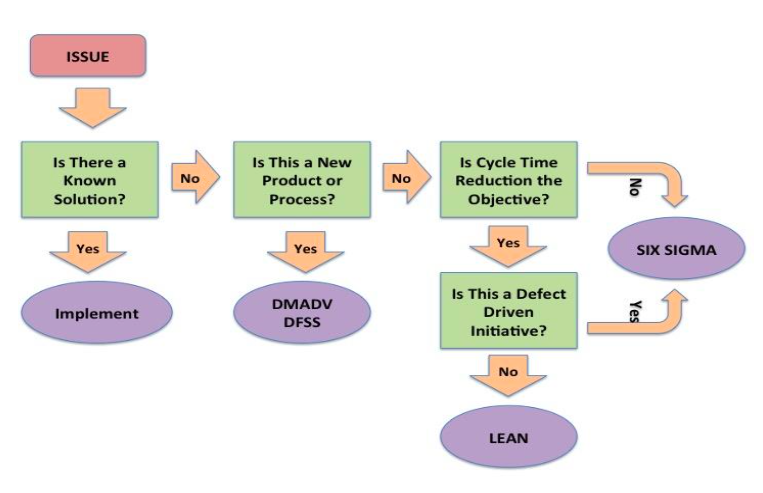 The flaw in this flow chart and thought process is that it implies that Lean is only helpful for cycle time reduction and that Six Sigma is the only methodology that can reduce defects. As I've said repeatedly on this blog, Lean and the Toyota Production System are designed around improving BOTH flow and quality. The methods (such as mistake proofing / error proofing / poka yoke) and the management mindsets (allow people to pull the andon cord when they see a problem) all contribute to reducing defects in a very practical way. 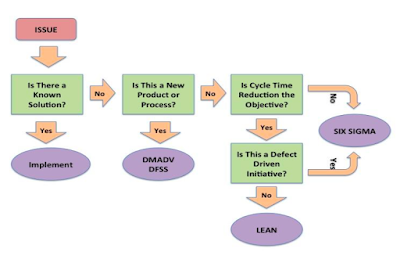 Diagrams like this don't help people understand the differences between Lean and Six Sigma or the complementary nature of the two. Sometimes, I feel as if there is a tacit effort on the part of Six Sigma devotees to subordinate TPS under a Six Sigma umbrella when, in reality, TPS is quite effective at reducing defects and variation. It's hard to tell if it's intentional or just incompetence. Many people learned the "truth" of this from the Michael George book "Lean Six Sigma" and they're just passing on that misinformation. It's probably just a matter of cluelessness more than anything.